C'mon enough with using the spoon to serve that ice cream! You chisel out useless little slivers or bend the spoon. Or, like me you put the entire carton in the microwave to soften it up only to have a gloppy mess. Try the Zeroll Aluminum Ice Cream Scoop with heat conductive fluid sealed within the handle makes scooping and serving faster and easier. And makes you look like the ice cream pro you are. 40 portions per gallon of ice cream. Who's with me for some Rocky Road? Or mint chocolate chip! MADE IN USA!!! 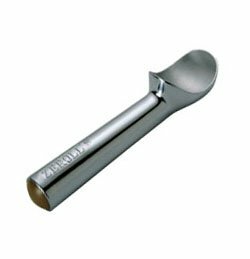 If you are serving out of an ice cream tub (5 gal) or doing more heavy duty serving or custom ice cream applications, please check out our made in USA Zeroll ice cream spade! Note: Zeroll Scoops/ Spades should be hand-washed only as dishwasher could damage heat conductive elements in the scoop and it may not function properly.